There was a point where I thought I’d have to trash the whole thing, but I persevered, and despite a rather major misstep, it all came together at the end. I’m still not quite sure how. Nathaniel wanted banana bread. 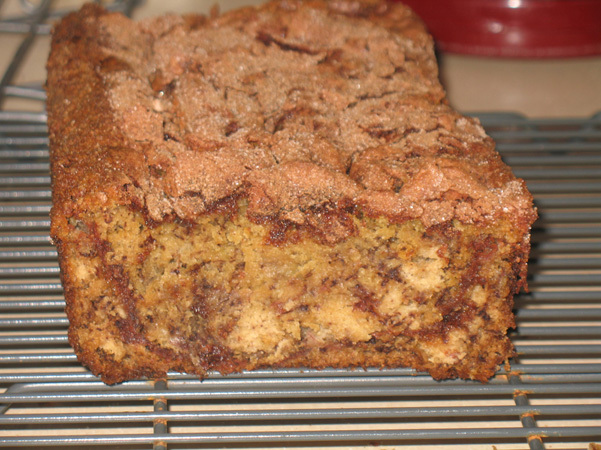 I have a tried and true recipe from long before I went on this deranged baking frenzy, but I thought it would be fun to try something different, and this cinnamon swirl banana bread sprang to mind. I pinned it over a month ago. What’s not to love about bananas and cinnamon? 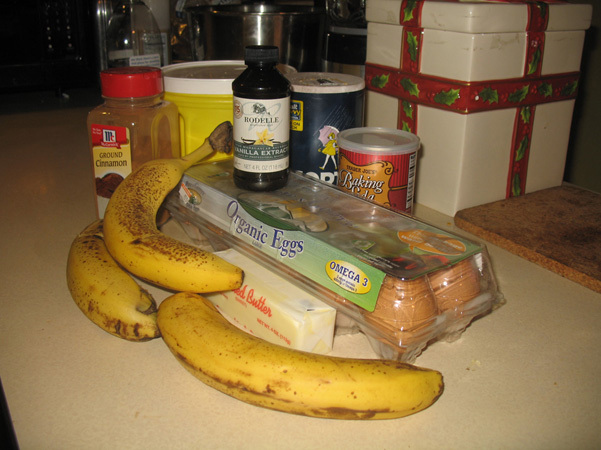 I assembled the ingredients, only realizing after I’d already mashed up the bananas that I didn’t put the flour in the ingredients photo. So you’ll just have to pretend it’s there. 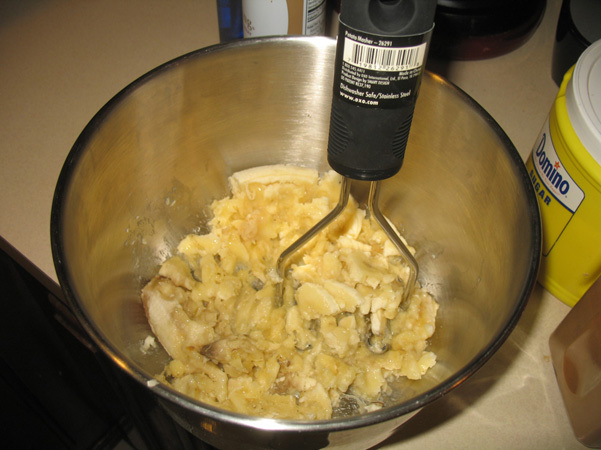 Then I mashed up the bananas. I can’t believe it took me until last night to recognize the value of the potato masher in this endeavor. I’ve always used a fork, probably because the first time I made banana bread, the instructions said, “mash bananas with a fork.” But apparently a device designed exclusively for mashing has been sitting in my kitchen this whole time. Who knew? 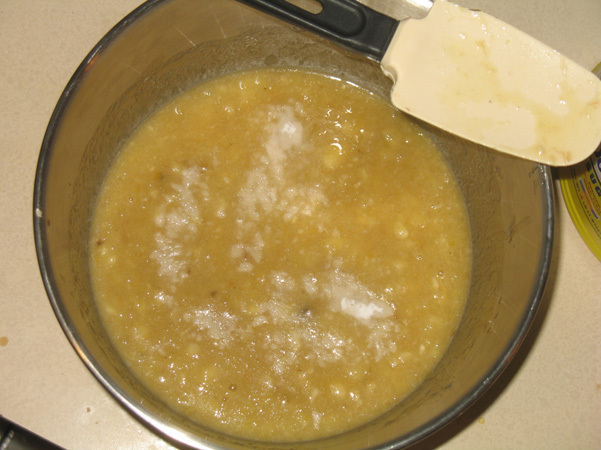 I mashed away in record time, which was good, because one of the bananas was so old it was grossing me out. 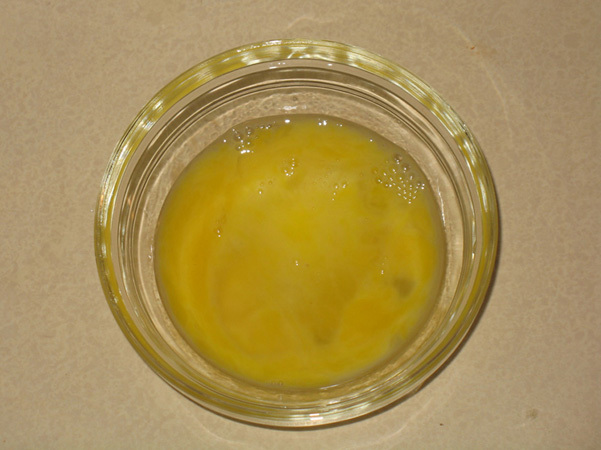 I added in the egg, melted butter, sugar, and vanilla. Then, per the specific and intriguing instruction, I sprinkled a teaspoon of baking soda and a dash of salt onto the mixture. I added the flour (whole wheat white, my flour of choice for most recipes) and incorporated, resisting my instinct to keep mixing. I find mixing very soothing. But I stopped once there was no more visible flour in the batter. 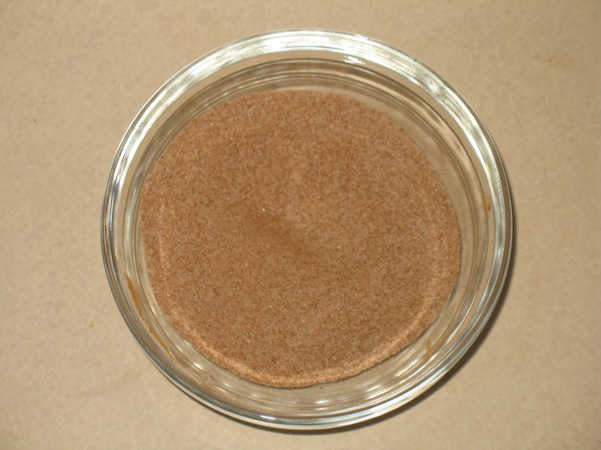 And then I got out another little glass bowl, and mixed together some sugar and cinnamon. I like sugar and cinnamon quite a bit but did NOT stick my finger into the bowl. Promise. And then came the part I usually don’t do so well with. 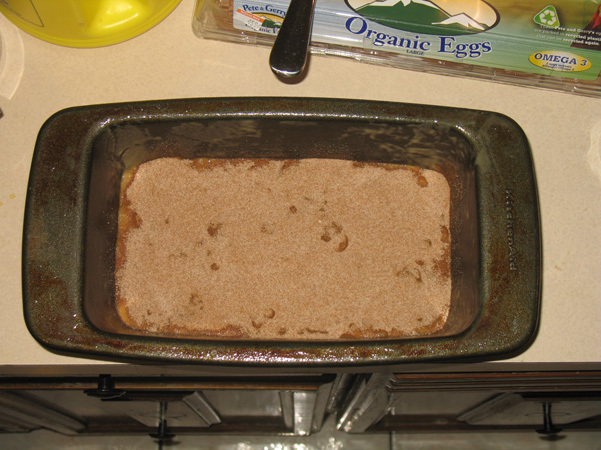 I had to pour half the batter into the loaf pan, sprinkle the sugar/cinnamon mixture across it thoroughly, then add the rest of the batter, then sprinkle the sugar mixture on top of that. Behold. At that point, Nathaniel came in to see how his banana bread was doing. 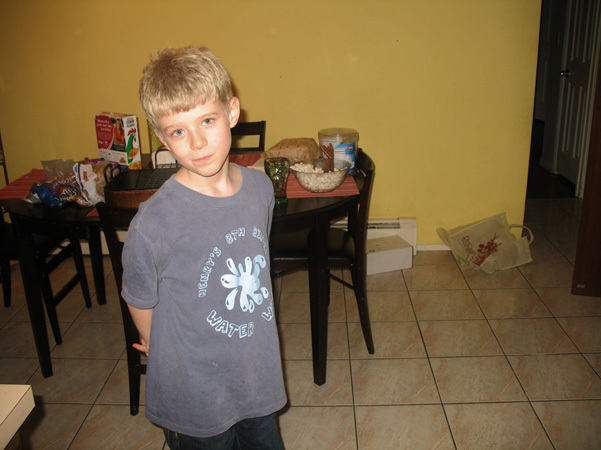 He also wanted me to see some dance movies he’s been working on, and now he does that beat box thing in the background while Juliet dances, and he wanted to show me what that was like without the Juliet part, since she was already in bed. Who could resist making banana bread for this boy? 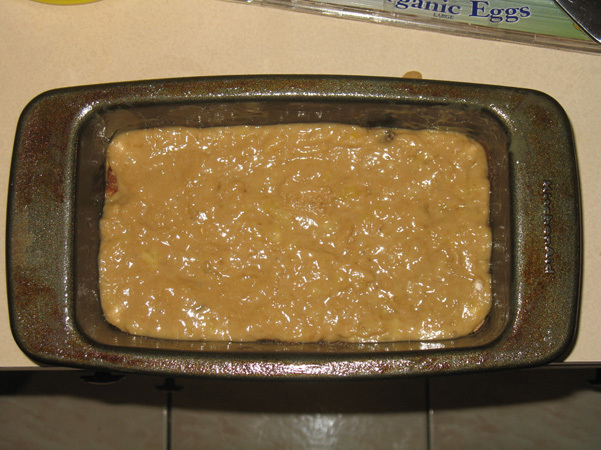 I put the banana bread into the oven, and that’s when things started to go wrong. The recipe said 50 minutes, presuming one was using a 9 x 5 pan, and I have no idea what size my loaf pan is. Maybe it’s 9 x 5, maybe it isn’t. So I kept an eye on it. And while it was cooking, I wanted to whip together some banana muffins because I have completely run out of breakfast muffins, and still had a couple of gross-looking bananas to use up. 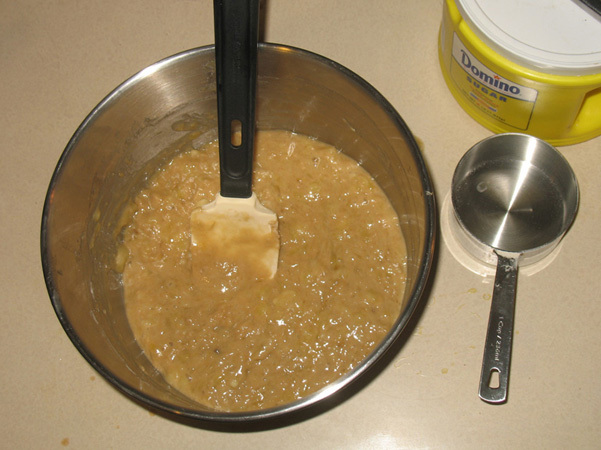 So I mixed and mashed and stirred and poured and got all that ready while the banana bread was baking. About 35 minutes in, I had a look, and the top looked quite done. I stuck a toothpick in and it came out visually clean, but when I felt it, it seemed like there was still some stickiness, so I gave it a few more minutes. Next toothpick seemed clean, so I took out the banana bread and in went the muffins. Fifteen minutes later, the muffins were out. 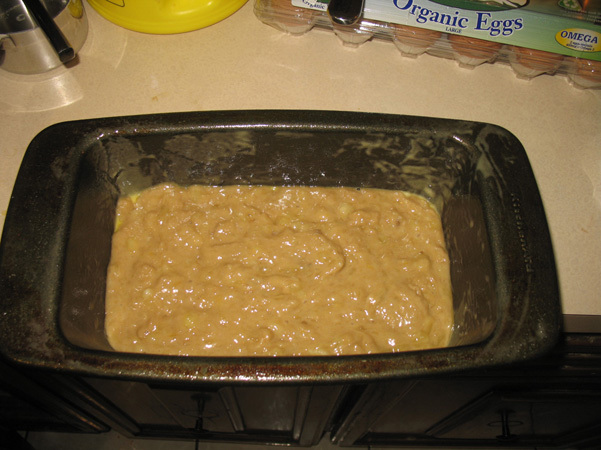 Fifteen minutes after that, I went to remove them from the pan, and then turned to the banana bread. 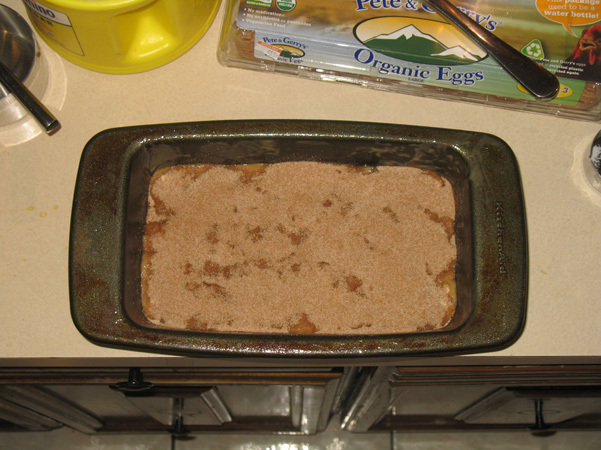 I put the rack on top and flipped it over to get the loaf out of the pan…and all the cinnamon & sugar on top plopped onto the counter. Not only that, but the loaf barely made it out in one piece; it wasn’t cooked through. Carefully and delicately — not normally at the top of my skill set, I confess — I got it back into the pan and fired up the oven again. I had no idea idea if I could save this loaf, but I do have a lot of determination, so I forged ahead. I randomly decided that 13 minutes would do be right. I just felt it. So back into the oven it went, and 13 minutes later, out it came. I still wasn’t sure if it was done. The toothpick was mostly clean, but was it the cinnamon on it or something not properly cooked? How do you know if it’s done when you can’t cut it open? Dave has this problem with chicken all the time, so he was very sympathetic but had no secrets to share. I waited about 20 minutes, then flipped it over again. It held together. I had hope. We waited another 10 or so, then Dave watched as I cut a piece from the end. It looked pretty good. It smelled pretty good. We tasted. Holy moly, this bread is fantastic. It’s a full on treat, with all that sugar, and utterly delightful. 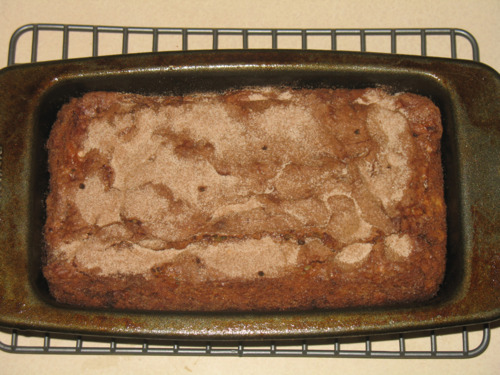 Soft with a nice crumb, moist without being over the top, lovely banana flavor, amazing sugar cinnamon crunch on top. We both gobbled some up last night. This morning, Nathaniel had some for breakfast, and was delighted. While I was still in the throes of fretting about the baking time, I went through the reviews, and learned that a lot of people baked it for 40 minutes instead of 50, and that someone took the recipe and lightened it up. I think next time I will try that version, because it could still be sugary sweet and buttery and delicious without being as over-the-top as it is. But either way, it’s a fantastic find. I still can’t believe it survived cooling and then going back into the oven. Phew.